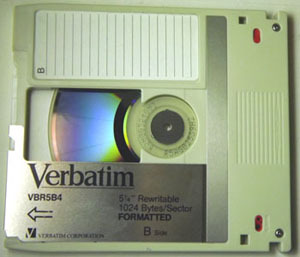 This is an example of a computer programme stored on paper tape. The tape was fed through the reader by the line of smaller tractor holes. The programme on the tape is a 'Double precision signed multiply subroutine' and is dated 1965. It was written for Digital Equipment Corporation's PDP8 computers. In the 1970's Punched Cards were commonly used to store data and programmes. An example of a punched card is shown right. It not shown to scale and the card actually measures just over 8 x 18 cm. Core memory was a common form of electronic memory in the 1970's and earlier. It is made up of small ferrite beads. These beads can be magnetized and demagnetized individually. They are wired up on a matrix of fine copper wires like a tapestry. Each bead has three wires through it: Row, Column and sense wires. The sense wire was required to check if a location bead was written to or read. Both actions changed the magnetization of the bead. Therefore, if the location was read it needed to be rewritten. Interestingly this type of memory is non-volatile. It is also where the processor crash term 'Core-dump' comes from. This type of memory was very expensive. The circuit board, this image was taken from, had a total memory of 16Kbs and is thought to be from an 'Argus' computer. Core memory was never used in small computers. A close-up picture of ferrite Core Memory beads is shown on the right. 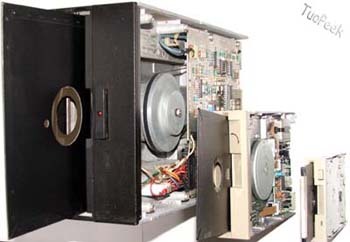 The Alpha processor was manufactured by Digital Equipment Corporation in the 1990's. It was a RISC (Reduced Instruction Set Computer) processor and it had the fastest clock speed at the time. The picture shows the underside of the processor with it's pin connectors. The metal lid has been removed so that the processor silicon and lead frame are also visible. The picture om the right shows how the physical disk sizes have reduced while storage capacity has increased over the same time. The largest disk (14" dia) in the picture has a capacity of 10Mb and dates from the early 1970's. The smallest, still in it's drive is under 2" and can hold 20Gb. 8" , 5", 3.25" and 2.5" are also shown. 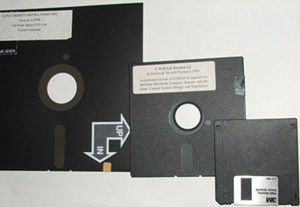 The now almost redundant 'Floppy' disk also shrunk in size from the original 8 inch shown here. 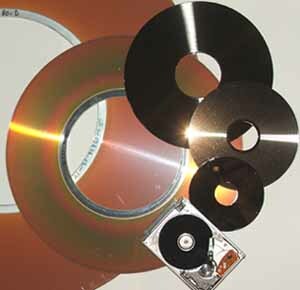 Both disk types store digital information by changing the magnetic property of the coating on the disk. A small read/write head uses a coil to either write or read the information stored on the coating. One point to note is that digital ones and zeros are not recorded directly on to the disk as magnetic media cannot record DC levels. 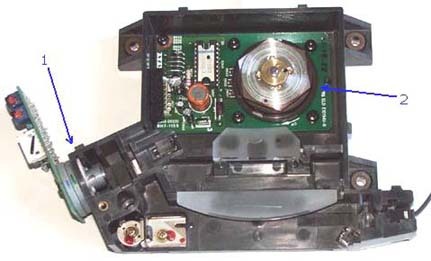 The scanning infra-red laser assembly from a laser printer and cover warning label are shown here. The laser assembly can be seen at (1) and at (2) is the multi-surface scanning mirror. The scanning beam emerges through the lens, seen here at the bottom of the picture. This mouse was manufactured by Digital Equipment corporation. It has fewer moving parts and a simpler design than the normal 'roller ball' type of mouse. The image shows three frames, the mouse, underside, and inside.